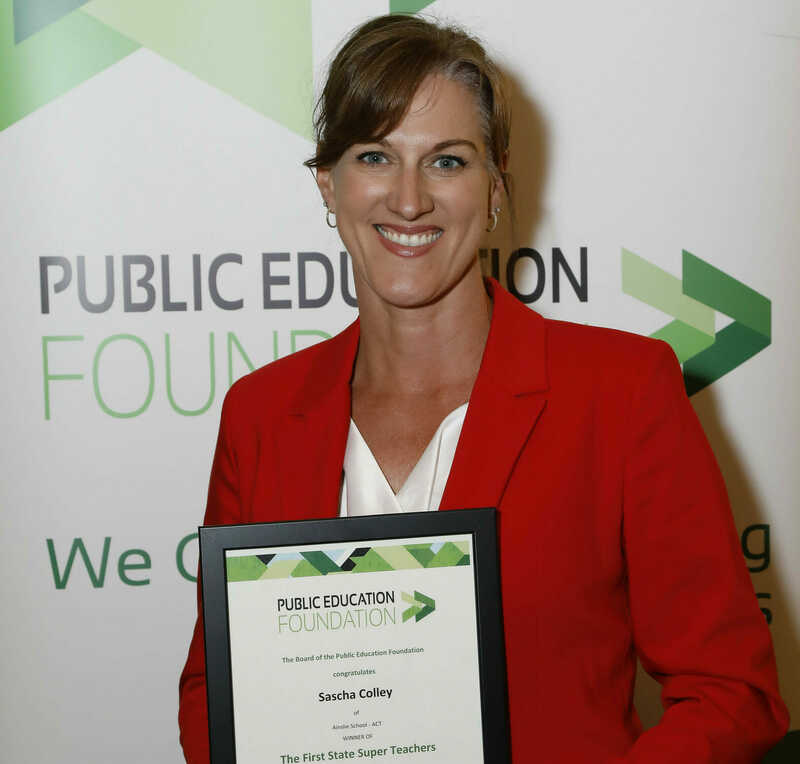 The Public Education Foundation is delighted to announce that Sascha Colley from Ainslie School in the ACT is the recipient of the inaugural Public Education Foundation’s First State Super Teachers Scholarship. She received her award at the Public Education Foundation’s Awards last night in Sydney. The Scholarship supports public primary school teachers teaching Early Stage One and Stage One with their professional development goals, providing up to $10,000 for professional development activities. Sascha Colley is currently leading the Kindergarten team of teachers at Ainslie School. She was awarded Early Childhood Educator of the year by the ACT Education Directorate for ‘learning through play’ programs. “Sascha Colley has an outstanding reputation as an educational leader in Early Childhood and Disability Education. It’s a privilege to be able to support her on her proposed study tour to Finland which will contribute to early childhood curriculum development in our public education system,” David Hetherington, the Public Education Foundation’s Executive Director, said. The Public Education Foundation is a not-for-profit organisation dedicated to providing life-changing scholarships to students and educators in public education, and enhancing the value and reputation of public education. First State Super is one of Australia’s largest profit-for-member financial services organisations. We provide our members with a better financial future through safe and secure superannuation and quality financial advice. Our size enables us to invest in ways that make a positive impact on the economy, the environment and the communities in which our members live, work and retire. Most of our members work in vocational roles that care for our communities. They are nurses, midwives, teachers, police, firefighters, paramedics and others who dedicate their careers to helping others. We believe that everyone deserves a dignified retirement. Through our financial planning company, StatePlus we provide high quality, affordable advice for members and all Australians. While we’re big, we see our members as individuals. We understand the role we play in safeguarding their savings and working with them to plan for the future they want.